Fifteen years ago, the country of Denmark hatched a master plan to harvest more than 5 billion kilowatt-hours of energy per year from straw. That’s right. The dry stalks of cereal plants, after the grain and chaff have been removed, are now a viable energy source, and Denmark is the current world leader in straw-based applications. But, the trend is spreading southward. Recently, Germany conducted a study on this agricultural byproduct with participation from the TLL (Thueringian regional institute for agriculture), the DBFZ (German biomass research center) and the Helmholtz Center for Environmental Research (UFZ). According to their results, straw has been significantly underused as a biomass residue and waste material. It’s one of Germany’s most important resources, accounting for 58 percent, and yet, it has been used as bedding for farm animals far more than for energy production. 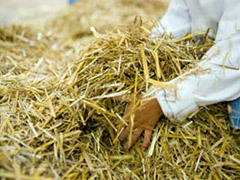 The scientists stated the potential of straw-based applications in the peer-reviewed scientific journal Applied Energy. Reportedly, between 8 and 13 million tons of straw could be used sustainably for energy or fuel production giving 1.7 to 2.8 million average households with electricity and 2.8 to 4.5 million households the benefit of heat. According to TiloArnhold’s article on RenewableEnergyWorld.com, “It must be taken into consideration that cereal straw plays an important role in the humus balance of soils. For this reason some of the straw must be left scattered on the agricultural land to prevent nutrients from being permanently extracted from the soil. To calculate the humus balance of soils three different methods of calculation were tested by the team of scientists. Depending upon the method of calculation used, 8, 10 or 13 megatons of straw can be used sustainably every year for energy production — i.e. without causing any disadvantages to the soils or other forms of utilisation. "To our knowledge this is the first time that a study like this has been conducted for an EU country, demonstrating the potential of straw for a truly sustainable energy use, while taking into account the humus balance," stresses Prof. Daniela Thraen, scientist at the DBFZ and the UFZ. So, Germany will most likely join Denmark in this clever experiment of sustainability. It makes you wonder what other countries could try it. The degree to which the straw-based applications will contribute to greenhouse gas reduction will have to depend on how they’re used. A reduction Compared to fossil fuels, the reduction can be somewhere between 73 and 92 percent when using straw for heat, combined heat and power generation or as second-generation biofuel production. Given the conditions prevalent in Germany, the use of straw in combined heat and power generation and in areas with the appropriate power plants would be best for the climate. Posted on October 30th under Energy From Waste.